The following guest post was written by Pete Reynolds. Pete is a sports fanatic and lover of transporting by pedal power. He is the co-founder of Discerning Cyclist, a blog devoted to showcasing and reviewing the best urban cycling clothes and accessories. In May, I was lucky enough to embark on a tour of the west coast of North America with my good friend, and fellow writer, Lewis. Starting in Vancouver, we eventually worked our way down to Seattle, Portland and Lake Tahoe, before reaching our end destination: San Francisco. Our mission? Good fun, heart-attack inducing food, IPAs, and, of course, cycling. We’re both originally from England, but now live in different parts of Europe. Lewis, prior to recently moving to Malta, dwelled in southern Spain, while I’ve spent the past three years in various parts of Germany after leaving Andalucía at the end of 2014. Over the years though, while running our urban cycling style blog, Discerning Cyclist, we’ve experienced cycling in many of Europe’s great – and some not so great – cities, including the famous cycling havens of Amsterdam and Copenhagen. We were well aware that - especially with Vancouver and Portland - we would be visiting some of the best cycling cities in North America during our trip, so our conversation often ran off into discussing the differences and similarities of cycling in Vancouver to cycling in Europe. This post is a summary of some of those observations. First off: Vancouver. What a city. It has everything: hiking on your doorstep, an incredible coastline, skiing in the winter, and big city life - ranging from the absurdity of Granville Street to the wonderfully chipper Gastown. 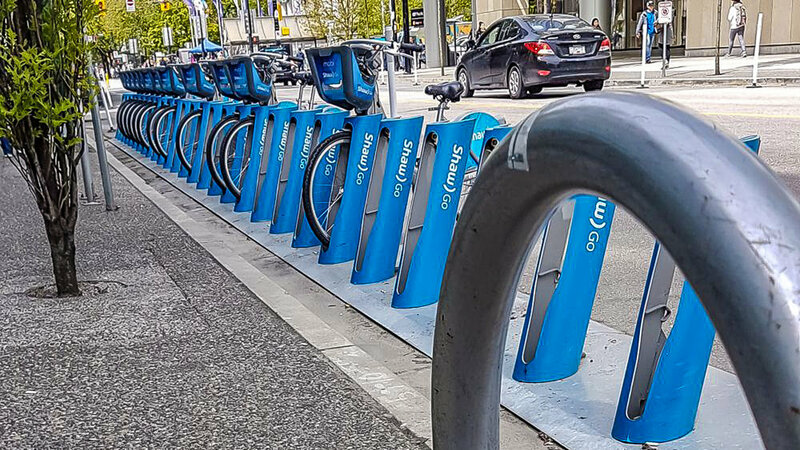 During our five days in Vancouver, we got on bikes at every opportunity, renting wheels from Reckless Bike Stores and the city bike share scheme, Mobi. Our journeys ranged from cycling the city’s streets, to idling around Stanley Park and following the path along False Creek to Kitsilano Beach (my personal favourite). There’s no missing the bright green bike lanes of Vancouver – which is certainly no bad thing. Whereas bike lanes in the likes of Copenhagen and Amsterdam tend to stay on the same side of the road as traffic, Vancouver has effectively created separate parallel streets, with cyclists heading in opposite directions on the same path – much in the same way as large segments of London’s new blue Superhighways. Is it better to have all the cyclists sharing one big lane, rather than two one-way lanes? I don’t really know. It certainly reduces the chances of pedestrians accidentally wondering out into the bike lane (the green paint doesn’t hurt either). What’s more important though, is the fact that most lanes have a physical barrier between the bicycle lane and motor vehicle lanes – preventing any unwanted parking in the lanes and reducing the chances of collisions. The vast expanses of bike lanes across the city are also key, as, while they don’t cover every street, most routes around the city are mostly navigable by safely using protected lanes. Safely moves us onto the big, horrible topic… helmets. Now, wearing a helmet when cycling in Vancouver is mandatory and failure to comply can result in a fine. So, while I don’t condone breaking the law, I can’t confirm that we wore our own helmets religiously. I know, how reckless of me. But… I cycle at about the pace of a fast run, and mostly stick to designated bike lanes. Where’s the danger exactly? If a car ploughs into the bike lane? If I fall off my bike? Well I don’t wear a helmet when I go for a walk, jog or a knees-up (although maybe I should for the latter), so what’s the difference? This is absolutely not to say I am against ever wearing a helmet. For example, I whole-heartedly agree with helmet use when: mountain biking, racing, mixing it with traffic and for children still developing their motor skills. Also, this is not to say you shouldn’t wear a helmet. I am absolutely pro-choice. Nevertheless, I was impressed to see that helmets were actually provided with the Mobi bike scheme, although Lewis, who has – shall we say – a sizeable cranium, was unable to squeeze into the helmet provided, so I also went without in an act of solidarity. If, at this point, you’re in an irate state with what I have just said regarding not wearing helmets, I will refer you to the Netherlands, Germany and Denmark, where there are no helmet laws, vast numbers of cyclists, most of whom go without headgear, and no proportional increase in the number of injuries or fatalities. Elsewhere in Europe, helmet use is a mixed bag. While there’s no mandatory helmet use in most of the continent, cycling in Britain without a helmet is a faux pas to many – although in no way illegal. Nevertheless, you’ll likely be labelled as reckless and a burden to society, thanks, in part to the highly anti-cycling press and media which will make sure to include the line, “the cyclist, who was/wasn’t wearing a helmet” in every single article, giving the audience a clear character assessment for the cyclist in question, regardless of their level of fault. Exceptions to the no helmet norm in Europe occur in Spain, where they will quite happily slap you with a €200 fine if you are not in possession of a helmet. They aren’t too concerned if you’re not wearing the helmet if you’re going up hill or if it’s hot (which it often is) – as long as it’s with you, which begs the question of why a helmet is needed at all? Does your head become immune to impact injuries when the sun shines? In every city and nation in which cycling is popular though (namely the aforementioned trio of Netherlands, Germany and Denmark), there is a very clear pattern of no helmet laws, and low percentage of helmet use. I whole-heartedly believe that mandatory helmet makes cycling appear more dangerous than it is and puts off would-be cyclists. Moving on to a less controversial and more commonly shared viewpoint among cyclists: hills are [insert expletive here]. And man, does North America do the worst hills. Man-made hills with consistent grades, and a complete lack of ebbs and flows. Yuck. I don’t know how people can get about Vancouver on a fixie. Fair play to those who do, though. A good set of a gears is needed for getting around the city, but if you have them at your disposal, dealing with the slopes is not much of a problem – much like in my British homeland. However, unless you like the burn on your daily commute, cycling on the wonderfully flat landscapes of much of central Europe is a lot easier. One thing I really liked about Vancouver was just how easy it was for a visitor to get a bike just about anywhere. There were plentiful bike hire shops around which offered reasonable rates and good quality bikes, while the Mobi city scheme was also very good and fairly priced. Mobi is also one of the easiest-to-use bike schemes I’ve come across. City bike hire schemes are common place around Europe, but figuring out how to actually get going on a bike is often a considerable headache. 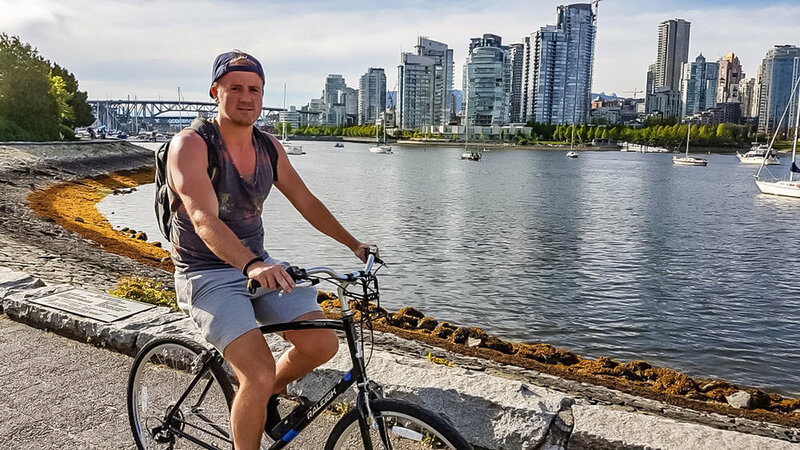 Which is Better: Cycling in Vancouver or Europe? Overall, I’ve got the result down as a score draw. 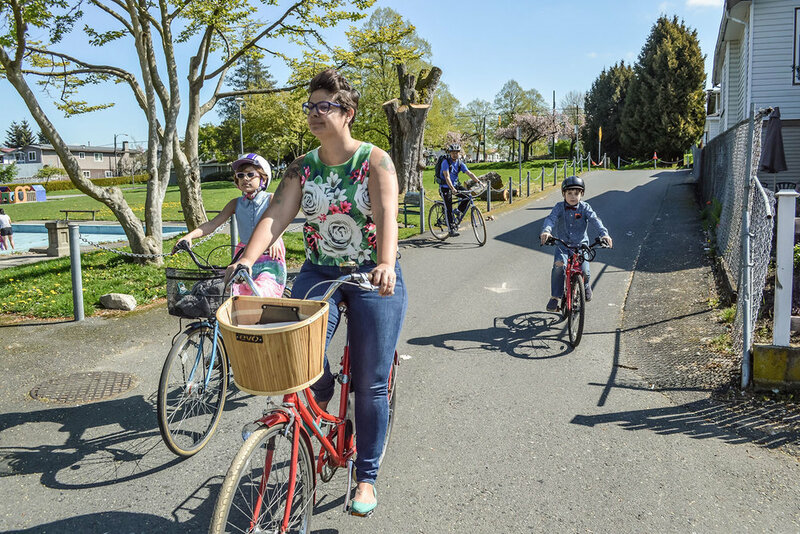 When it comes to helmets and the lay of the land, Europe is a clear winner, but with easy access to bikes and a very good cycling infrastructure, Vancouver edges it. There’s no doubt Vancouver is heading in the right direction on two wheels. I thoroughly enjoyed my time in Vancouver, it’s a truly magical city and one I hope to return to in the future.